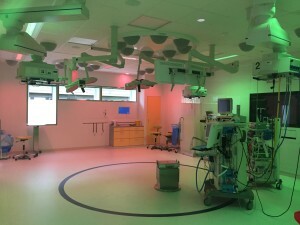 The hospital Norra Älvsborgs Länssjukhus, NÄL, has been provided with an operating area with the latest equipment and Ergonomic Lighting from Chromaviso. The lighting solution is used for keyhole surgery as well as open surgery. 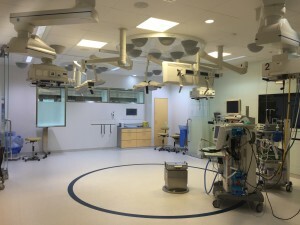 The operating area consists of modular and flexibly constructed walls, the latest technologies within video handling, soundproofing and a ventilation system that improves hygiene significantly. 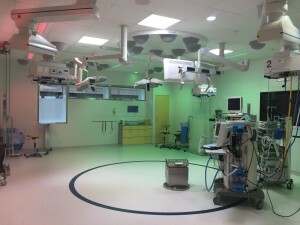 Furthermore, the Danish lighting concept Ergonomic Lighting from Chromaviso, which is used in several Swedish hospitals, is installed in all operating rooms. The light is zoned, coloured lighting developed specifically for operating and examination rooms. ”Ergonomic Lighting is a standard. 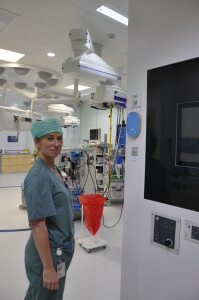 I want it in all operating rooms”, says the project manager of the project at NÄL, Gunilla Bodén-Olsson. “We used to work in darkness or in completely white light. We are very happy with Ergonomic Lighting, it is very comfortable to work in, as we are in the operating room many hours each day”, explains Maria Jakobsen, who is a nurse and a part of the group working on the renovation project. Ergonomic Lighting consists of a number of light settings for before, during and after a procedure. A clear and bright light for cleaning and preparation, a warm light for receiving patients as well as various settings with coloured and white light for operation, depending on monitors and procedure. Furthermore, there is a white spot for the writing position in the room. This lighting solution consists of an effective combination of green and red light that provides documented results with regard to working environment, quality of procedures and patient safety. The concept has been developed by Chromaviso. The lighting concept has a documented effect with regard to improved visual conditions, less reflection and clearer contrasts. Furthermore, the light results in less fatigue and increased concentration for surgeons, anaesthesiologists and nurses. Moreover, the lighting solution at NÄL has the new specially developed setting for open surgery. By turning up the light in the room and turning down the surgery light, you achieve a pleasant lighting environment with less glare and flickering for the eyes, when you look away from the open field and into the room. ”The white light works very well for open surgery, which we have a lot of – for example hip surgeries. It is bright and good, and the difference from the surgery light and the light in the room is not substantial. It is much better for your eyes”, says Maria Jakobsen. The light is operated through a specially designed control panel with nine settings. ”We have a very good process testing the light and then adjusting it to suit our work. It is now very easy to operate”, says Maria Jakobsen. 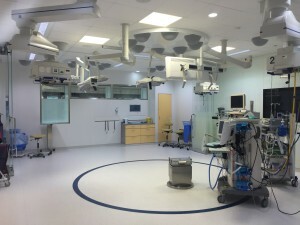 The new operating area was ready in 2015. A turnkey solution for an entire operating area with four operating rooms – all with Ergonomic Lighting. An excerpt of the other equipment in the operating area: modular and flexibly constructed walls, the latest technologies within video handling, soundproofing and an effective ventilation system. Medirum has been responsible for the complete overall solution.